MountCrest University College Unveils its Brand-New Moot Court Facility. 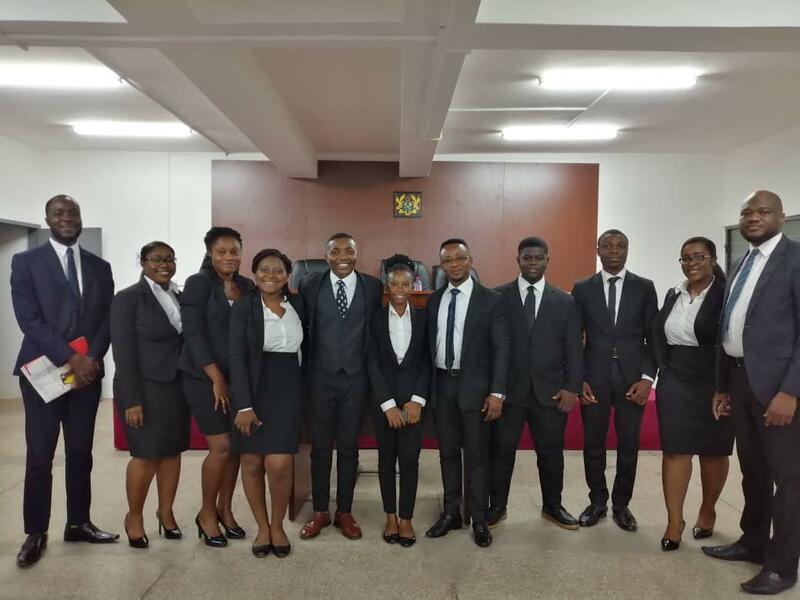 The Students’ Representative Council of MountCrest University College (MCU) unveiled its new moot court facility in honour of the late Professor V.C.R.A.C Crabbe, with a maiden moot court performance. 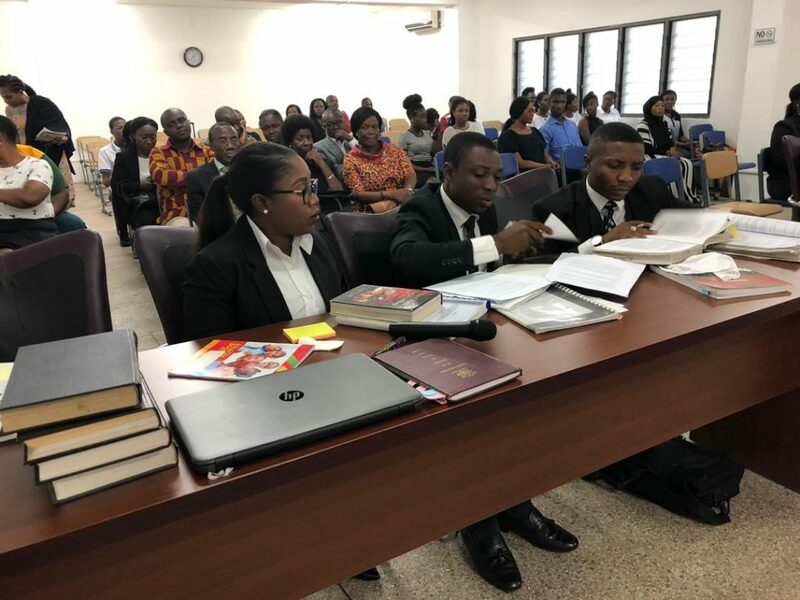 The event, which was held at MCU’s Kanda campus, was presided over by three Justices of the Court of Appeal of Ghana: His Lordship Justice Amadu Tanko, Her Ladyship Justice Mabel Agyeman and Her Ladyship Justice Angelina Dormakyaarea. The moot was on a Constitutional Matter and Counsel for the Applicants invoked the original jurisdiction of the Supreme Court, Article 2(1) and 130 of the 1992 Constitution to give an interpretation and enforcement on Article 144 and 128(4) of the 1992 Constitution on the appointment of the Chief Justice. Counsel for the Respondent prayed that the court dismiss the case as the President had followed due process in appointing the Chief Justice quoting the same articles as quoted by the counsel for the Applicants. The presiding judges admonished both parties and the gallery to treat the proceedings as they would treat a court in session. Both parties were told about the marking scheme which included advocacy, due observance of court rules, command of the English language, appearance, knowledge of the facts, knowledge of the law, citation and ability to refute. Marks given were for both oratory and written submissions. At the end of the court session, the matter was dismissed in favour of the Respondents with a score 75 percent. The two-hour event saw members on both sides making their argument to persuade the judges to rule in their favour. Counsel for the Applicants was led by Mr. James Adodo and the Respondents, Mr. Mohammed Anyass. There were many humorous moments in the court on account of the impressive performance of both parties. The presiding judges in their concluding statement lauded the SRC for the splendid moot court facility and the excellent advocacy skills and well-researched written submissions. They praised the participants and encouraged the student body to keep the excellent initiative. In attendance was the management team, staff and students of all streams from MCU. There was also a solidarity attendance from Ghana Institute of Management and Public Administration (GIMPA) Faculty of Law. The exciting ceremony came to an end with an award presentation to participants, meet and greet session, photo session and refreshments.